↑ Ankeny, Jason (2004). 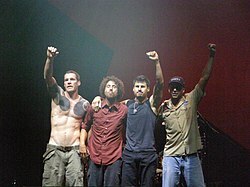 [เรจอะเกนสต์เดอะแมชชีน ที่ออลมิวสิก "Rage Against the Machine – Biography"] Check |url= value (help). Allmusic. สืบค้นเมื่อ 2008-09-08. ↑ Ankeny, Jason. "Urban Dance Squad – Biography". Metrolyrics. ↑ Berdini, Valerio. "live on 35mm.Berdini,Valerio". WordPress.